Though it is normally our policy to review only products that we feel you should know about for reasons that are good, there are a number of products blighting the landscape (some spendy) that are so awful we'd be remiss in failing to warn you about them. If you are like us, blowing hard-earned cash in these austere times is less than a great thing. 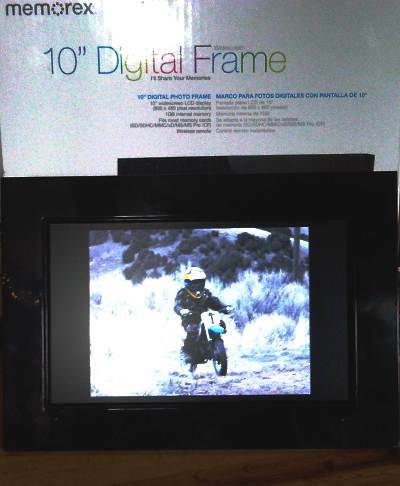 The Memorex MDF1071BLK 10" Digital Frame we recently acquired qualifies as an item of miserably poor quality that is not worth wasting a dime on. Even though this device is only peripherally related to motorcycling it's in a very popular category of consumer electronics so chances are reasonable that many of you may come across one. That being the case it's practically our duty to share our disappointment. 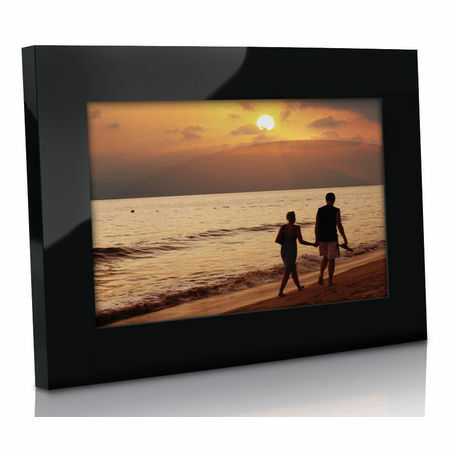 The Memorex MDF1071 earns our worst product of the year award hands down. We bought our Memorex MDF1071BLK at a Fred Meyer store a couple of months ago to spruce up MoJazz headquarters with a sideshow of some of our favorite motorcycling photographs. And though we were, even at the outset, unimpressed with the wonky, non-intuitive setup menus, inability to randomize image sequence and disappointingly poor image quality, we at least expected that an electronic device with no moving parts would provide trouble-free (if less-than-scintillating) performance for more than a month. Not so. Our Memorex digital frame began to freeze after a few weeks of use. At first we could turn the unit off then back on to get it going but that ceased to be effective after a few more weeks (now we have to put it in the freezer). A brief perusal of the web revealed that we are far from the only owners of this item to experience similar issues. At least, we reasoned, Memorex should be aware of the issue and getting a replacement should be no particular problem. We should have studied those unflattering online reviews we found a little more thoroughly. It turns out that the poor quality of the Digital Frame itself pales in comparison to what passes for warranty service. After an exchange of more than the necessary number of emails (replete with poor grammer and misspelled words from the customer service rep) with the same individual, probably operating out of his kitchen somewhere overseas, the bottom line is that we are stuck with our malfunctioning frame. It turns out that without the actual store receipt no other proof of purchase (such as a registered warranty card or credit card receipt) will do. I guess that Memorex wants to make absolutely sure that a suspect unit is not one second over the 90 day warranty - which is all that it comes with. We are in possession of enough cameras and other digital devices to load a freighter down to the waterline. In several decades of dealing with warranty service on various cameras and computing devices we've never encountered such poor service - even on very expensive items that were actually out of warranty. Since we've read stories on other consumer sites of replacement units that were actually inferior to the unit replaced it looks like we just saved ourselves a lot of trouble. You should save yourself completely and just keep right on walking by if you see one of these on a store shelf.